Within Teamwork Projects, you can view and manage each of your projects in a Gantt chart, giving a graphical 'timeline' representation of your project. A column showing your task lists, tasks, subtasks and any attached milestones. A completion percentage here tracks the progress when you complete tasks while viewing the Gantt chart - if you use the button at the top to show completed tasks too, this will update to show the overall completion based on tasks already completed. You can collapse and expand each task list using the arrow to the left of the task list name. Timeline - this is at the top of the chart, showing months and days. Weekends are highlighted in grey. Tasks - represented by coloured bars, the colour is associated with a person on the project automatically when they are invited and is fixed. Tasks are grouped together into task lists, which have a grey bracket above each to show the earliest start date and latest due date of any task on the list. Next to each task, you'll see the name of the person assigned and the duration (this is the automatically calculated difference between the start date and due date, and includes weekend days). Lines with arrows from one task to another represent dependencies. Milestones - shown as an orange diamond at the bottom of their attached task list, on the day that they are due. Only Milestones which are attached to a task list will show on the Gantt chart. 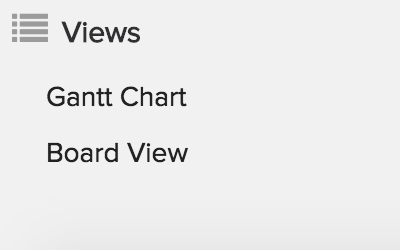 You can move around the chart by grabbing and dragging the main area, zoom in and out by scrolling or using the buttons at the top, or use the 'Show All' button to automatically zoom and centre the full chart in one view. 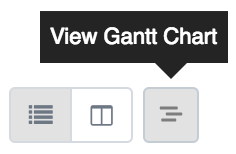 The print button launches the print window with the current view of your Gantt chart. Use the 'Show Completed' button to include completed tasks in the chart, these will be shown in grey and cannot be edited in this view. Enable the 'Auto Save' option to make sure your changes are automatically saved regularly while you work in the Gantt chart view, and use the 'Exit' button to close the Gantt chart and go back to your tasks area of the project.